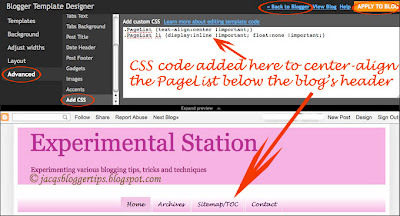 Thanks to Vanessa Morgan who had recently visited this blog and wanted to know how to center the horizontal page tabs below the blog's header. That spurred me to google for answers after several hours of failed attempts to do it on my own. I'm terribly happy to have learned much from GreenLava, the guru at Blogger Sentral who's most helpful and generous in sharing his knowledge and expertise. THANK YOU! By default, the Pagelist or Pages gadget is left-aligned in Blogger blogs but can be easily aligned to the center if you so desire. Sign in to your Blogger account. At Dashboard, click Design | Template Designer. The alignment of the pagelist to the center will be reflected instantly in the live preview below. If you're satisfied with the changes, just click the orange button, Apply to Blog, to save changes. 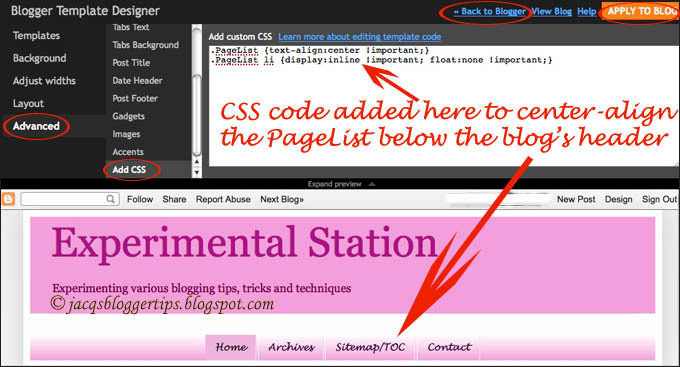 Finally, click the Back to Blogger button to quit the Blogger Template Designer and return to the Page Elements page. That's all to it! Easy, right? You're most welcome, Janie! Nice to know you liked it! Thank you for this, I have wasted hours playing with the code, googling and playing with the CSS, and only your instructions have worked for me. You've made my day! Just found your blog and omg I love it! I am a newbie and for the life of me, couldn't simply center my pages gadget! I did it! Thank you! Now off to search your site on customizing my post footer! I can't figure out how to have "leave a comment" on the main pages post! You're most welcome, Jessica! Great to know you're delighted. I tried this twice and couldn't get it to work...nothing changed. Any advice? Thanks. Jennifer, I saw that all's well at your blog now re centering your Pagelist gadget. That's great. This didn't work on my computer and idk what to do! Help?! Vishhal : Great to know... thank you! Shelby : Congrats! You've achieved it as seen in your blog!! Did you use a special kind of blogger template for this? I know I'm going to sound like a broken-record. but I can't get it to work. Or maybe it "kicks in" after awhile, even if it doesn't immediately? I was SO glad when I found this after searching for hours and trying to figure out how to edit HTML! I see you've got it working alright, Eva! Great! Jacqui,i can't get it right, i already copy from here and pasted on my CSS window, but there's no experimental window showing so i click Apply to Blog, and nothing happened. I don't know what to do next. thanks. Oh Jacqui, i closed the site, then opened my site again and repeat the process, and yes it worked after a sometime. Thank you so much. Yours are easy to follow instructions really designed for computer lingo naive people, hahaha! I am happy i did something lovely today. Now, what is left for me to do is how to put those reply links in the comments, just like yours. I am excited again. I deduced that you'd like to have the threaded comments, right? If so, just enable the feature at your blog by going to Settings > Posts and comments, then scroll down to Comment Location and select Embedded, followed by Save Settings. Dear Jacqueline, thank you for this tip! I've been searching all over this and you 'saved' my blog from looking weird! You're most welcome, Vanessa! Great to know you're happy! Tried doing this to my blog but didn't work. I used an eblogger template. Sorry, Nadia... whatever I know is already shared in the above tutorial. My pleasure in sharing, Michael! Great to know your search is over and I've put a smile on your face, Marisa! My pleasure, Shylu! Nice to know it worked for you. It didn't work on mine, can you tell me what you think why it isn't working? Thanks! Sorry, TheDanGalman... out of my league to trouble-shoot technical issues. Great to know that, Angel... I love sharing what I know that others can benefit! Thanks for your appreciation. What a breeze! Thanks for the helpful codes! I managed to align mine too! Thanks JustJaslin for your positive comment. Great to know that you've found the codes helpful and succeeded in applying them. Wow! I can't believe how simple that was. This is something that's been bothering me for a while now, I'm so glad now that it's fixed. Great to know that you're happy with the outcome, ttea! Sorry, Firas... I just know how to align on all pages as in my tutorial above. Wonderful! Thanks so much for this post! Any way you know how to remove the border from the panelist, as well? I just experimented removing the panelist border at my other blog. Just go to the Blogger Template Designer, scroll down the menu to 'Advanced' and choose 'Tabs background', then play around with the background and border colours to get your desired effects. I've done it in this blog and quite satisfied with the results. Hope this helps. I'm sure that is a way to add CSS codes but I'm not so technically skillful to do that. Sorry!! Bebeng, I noticed that you've already had your Pagelist centered, right? Thank you for this post! I have the page titles centered now, is there a way to add spacing between each page title? Mine look all crammed together. Thank you! You're most welcome, Brooke... the pleasure is all mine in sharing. You can change the px value as desired. The 10px is padding for top and bottom, whilst the 30px is for right and left of page title. I added the code to my css and it centers the pages fine in Firefox and Crome. When I look at my blog in IE the pages look centered at first then stack on top of each other. Any ideas why? I removed the css code until I can figure it out. Sorry, no idea why, Tina. thanks a lot for that code! Hi Jacqueline, can you tell me how to adjust pages on the top of the logo in the blogspot site..
Dinesh... I'm not so clear what you want. I gather that you want to relocate your pages to be above your blog's header, right? If so, just google with these words... how to add a gadget above the blog's header... or something similar.